VIENNA, January 29. / TASS /. The construction of the first line of the Nord Stream - 2-gas pipeline will be completed in November of this year, the second - in December, said Paul Corcoran, company financial director, at the European Gas Conference on Tuesday. "The first line [of the Nord Stream - 2] will be ready in November, the second in December," he said. At the end of November 2018, it was reported that about 300 km of the pipeline had already been laid within the framework of Nord Stream 2. 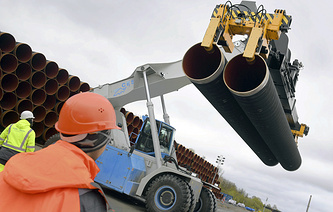 Two branches of the "Nord Stream - 2" should be built before the end of 2019. The total capacity of the project is 55 billion cubic meters of gas per year. The cost of construction is estimated at 9.5 billion euros. The pipeline will bypass transit countries - Ukraine, Belarus, Poland and other Eastern European and Baltic countries through exclusive economic zones and territorial waters of five countries - Russia, Finland, Sweden, Denmark and Germany. Only Denmark, which plans to block or postpone the implementation of the project, did not give its consent to the construction. The project operator has already submitted an application for an alternative gas pipeline route that will pass through the exclusive economic zone of Denmark to the north-west of Bornholm. The sole shareholder of Nord Stream 2 AG is Gazprom. Gazprom's European partners - Wintershall, Uniper, OMV, Engie and Royal Dutch Shell - will finance 50% of the project. The head of Gazprom, Alexey Miller, has previously stated that the implementation of the construction schedule for Nord Stream 2 makes it possible to speak of a possible start of gas supplies through this gas pipeline from January 1, 2020.